USB Monitoring Control (USBMC) - The USB Monitoring Control (USBMC) component library provides the monitoring functionality for your software application. 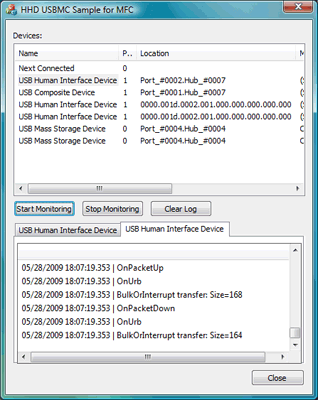 The component library lets you enumerate all installed usb devices and attach a monitor object to receive transferred data and control packets. The Monitor object can be attached to and detached from the device at any time, no matter if the device is being currently used or not. New filter driver internal architecture allows you to process data coming from high speed USB devices without introducing any delays. Detailed component library documentation with working code samples is included in USB Monitoring Control product package. Supporting a wide variety of programming languages (C++, Delphi, C#, VB.NET ) and platforms (Windows 2000 - Windows 7), the USBMC component library makes it easy to start implementing USB monitoring functionality in your software project. Qweas is providing links to USB Monitoring Control 2.12.00.2387 as a courtesy, and makes no representations regarding USB Monitoring Control or any other applications or any information related thereto. Any questions, complaints or claims regarding this application USB Monitoring Control 2.12.00.2387 must be directed to the appropriate software vendor. You may click the publisher link of USB Monitoring Control on the top of this page to get more details about the vendor.